The formulation of the fermented beer specialty is based on a 400 year old brewing tradition. 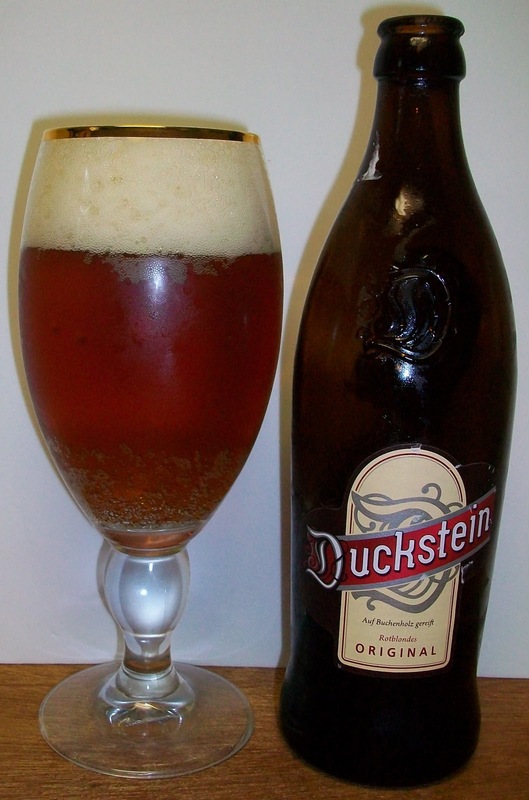 Selected ingredients and maturation to give Buchholz Duckstein original soft, slightly bitter caramel taste with a fine touch. 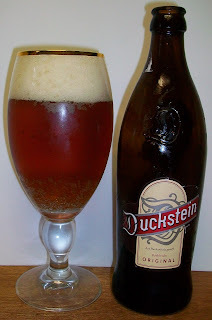 The airy foam and a clear reddish-blond color makes it visually a treat. This is a gift from my friend Gene. He was just in Germany and brought this back with him. The only issue may be that his luggage was lost for more than a week so I’m not really sure what kind of abuse this beer may have seen. The beer pours a clear dark copper with amber hues and a diminishing off white head. The nose is classic Altbier with caramel malt aromas and a very distinct earthiness almost skunky aroma. I still don’t know where that comes from but I usually like it. There is just a slight hint of floral hops on the nose. Wow, that is a different tasting beer. It is very good but has an odd complexity to it; almost like a blend of old and new beer. The experience starts out a light malt sweetness up front but that only last for a split second. It is immediately replaced by an earthiness and bitterness followed by an effervescence over the tongue during the middle of the sip. The back-end is fairly easy drinking with a carbonation release during the swallow. The finish is where all the flavors of this beer come together. There are sweet caramel malts along with a very unique earthiness, and a slight hop bitterness on the finish. There is just a slight aftertaste of lingering malts and that unique earthiness. All and all I am really enjoying this beer but it’s not the easiest drinking beer. There is a unique richness to it this beer that is hard to put your finger on and sometimes hard to swallow. OK it’s not hard to swallow but here is a good hesitation. I assume that is part of the odd Altbier style. This beer is getting more robust as it warms and opens up a little. The carbonation has diminished and the beer is smoother and richer now that the effervescence is not masking them. Altbiers are very unique, I really have to have more of them. I’m giving this a B+. That may be low but I really have not reviewed too many Altbiers. This beer has nice rich caramel malt flavors, nicely balanced with just a slight hop bitterness and the most unique earthiness.